When the revolution was formally commenced through the approval by the Continental Congress of the Declaration of Independence in July 1776, New Jersey remained one of the new states most divided by the break with the Crown. In Monmouth and Hunterdon Counties, Loyalists organized to defend themselves until they could gain protection from the British troops. In the first months of the rebellion, the independence forces arrested many Loyalists, seized their properties, and forced them to relocate from coastal to interior areas, away from potential rescue by ship. On August 27, 1776, after adopting the first state constitution in the prior month just before the approval of the Declaration of Independence in Philadelphia, the Provincial Congress chose William Livingston as the first governor of the State of New Jersey, some five weeks after the colony had declared independence and adopted its first state constitution. Livingston came from a wealthy, influential New York Presbyterian family who spent most of his early career as a lawyer and political activist in New York where he was elected to its colonial legislature. In 1772, however, he moved his family to Elizabethtown, and was selected as a New Jersey delegate to the First and Second Continental Congresses, leaving the Congress in June 1776 to accept appointment as the general in command of the militia defending eastern New Jersey. Livingston's first efforts to organize the militia, however, faced significant obstacles, particularly given the relatively high numbers of pacifist Quakers and ant-war Loyalists. The Continental Army also suffered a series of defeats in 1776 which led many to believe that the conflict would end quickly. In August, the British won a victory in the Battle of Brooklyn Heights, which forced Washington to evacuate his troops from New York to Fort Lee. In the next month, the Continental Congress meeting in Philadelphia dispatched Benjamin Franklin, John Adams and Edward Rutledge to cross New Jersey to meet with Admiral Lord Howe and his brother General William Howe on Staten Island, where they had unsuccessful talks concerning reaching an agreement for a possible armistice. ​ The British then continued to pursue Washington in New Jersey, who was compelled to burn bridges behind him to slow the British advance until he crossed the Delaware River into Pennsylvania, ostensibly to wait out the rest of the winter. To prevent the British from continuing their pursuit, Washington sent a message to Governor Livingston, directing that all the boats on the New Jersey side be commandeered and sent to dock on the Pennsylvania side of the river. Unable to pursue Washington's soldiers across the river, British troops took up winter quarters in various locations in New Jersey, including Princeton and New Brunswick, with a garrison of Hessian troops left to occupy Trenton. On Christmas night of December 26, however, Washington’s daring attack of the Hessians at Trenton, taking his army from Pennsylvania to cross the Delaware, restored confidence and helped him persuade his soldiers to extend the terms of their enlistments beyond the first of the year. 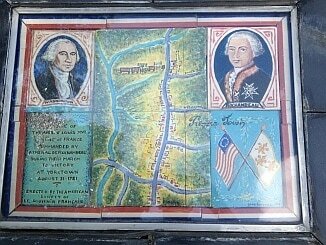 Following the victory, Washington established a defensive position south of the Assunpink Creek in Trenton to confront an expected counter attack by troops under Lieutenant General Charles Cornwallis, who left 1,400 soldiers in Princeton. On January 2, Cornwallis advanced with a force of 5,000 men to attack Washington in Trenton. Along the way, however, Cornwallis encountered harassing fire by American riflemen which delayed his arrival, allowing Washington additional time to reinforce his defenses. Three British assaults on Washington's position were repulsed. At night, Washington moved his army around Cornwallis's camp and marched north to Princeton, where the other British troops remained. On the next day, January 3, Washington arrived in Princeton in time to rally his advance forces, who had been beaten back in an initial assault which resulted in the mortal wounding by bayonet of General Hugh Mercer. Mercer was carried to a nearby house, where he died of his wounds nine days later. Washington's counter-attack forced the British to retreat north, where they left New Jersey to spend the rest of the winter in New York. After the Battle of Princeton, Washington’s army marched to Morristown to establish its own winter camp. 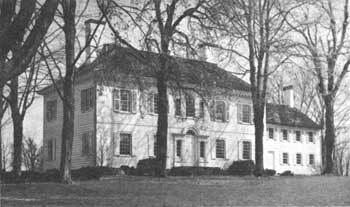 In 1777, from late January into March, and again in May and September, the Assembly met at the Indian King Tavern in Haddonfield to avoid security risks from potential British raids at more northern sites. While meeting at the tavern, the Declaration of Independence is officially ratified; the Great Seal of the State is adopted; and the word "state" is substituted for "colony" in all official acts. On June 26, Washington's forces of some 6,000 men engage in the Battle of the Short Hills, a series of skirmishes on the plains below the Watchung Mountains with the combined British and Hessian troops numbering 12,000 under the command of General William Howe. The Battle of Gloucester, the first battlefield command of the Marquis de Lafayette, is fought on November 25, with 400 soldiers under Lafayette attacking the British, killing about 20 and taking 20 prisoners. On June 28, 1778, Washington’s attempt to attack the British as they crossed New Jersey on their way from Philadelphia to New York resulted in a stalemate at the Battle of Monmouth. Washington blamed Major General Charles Lee’s timidity in violating orders to attack the British for the indecisive result, and Lee subsequently was court-martialed at a hearing convened in New Brunswick for cowardice, sentenced to loss of his command for a year. 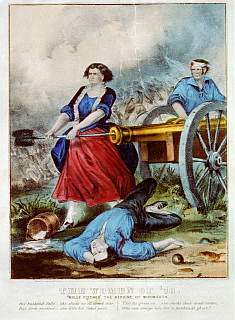 The Battle of Monmouth also becomes known for the role played by Mary Ludwig Hays, colloquially dubbed "Molly Pitcher," the wife of a Continental soldier, who carries buckets of water to the soldiers in the brutal heat and then is said to take up her husband's position at a cannon after he collapses from wounds or exhaustion. While the British stayed out of New Jersey for much of the rest of the War, on June 6, 1780, some 6,000 British, Hessian and loyalist troops came ashore at Elizabethtown seeking to cut off Washington’s army camped at Morristown, but were driven back. At the end of 1778 into the following spring of 1779, Washington and five other generals, including General von Steuben from Poland, stayed over the winter at homes in Somerset County. In August of 1779, Washington dispatched 300 cavalry under Major Henry "Light Horse Harry" Lee to attack the fort occupied by the British in what is now Jersey City in the Battle of Paulus Hook, with Lee's men succeeding in taking 158 prisoners, but choosing not to destroy the fort since it housed wounded soldiers, as well as wives and children. From November 1779 into the spring of 1780, Washington and his troops encamped at Morristown, enduring the coldest winter of the war. Although the British stayed out of New Jersey for much of the rest of the War, on June 6, 1780, some 6,000 British, Hessian and loyalist troops came ashore at Elizabethtown seeking to cut off Washington’s army camped at Morristown, but were driven back. 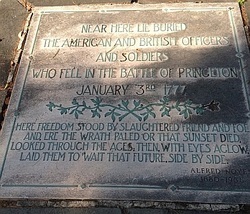 Without protection of the British troops in New Jersey, loyalist residents were subjected to repeated waves of violence. Many were hanged, and others driven from their homes into exile. Governor Livingston, who had little power under the new Constitution to maintain civil order, ultimately persuaded the Legislature to create a 12-man Council of Safety that effectively ruled the state with the Governor for the remainder of the Revolutionary War. In 1781, Washington was encamped in New Jersey when he joined with French soldiers at Princeton on their march south to Virginia, where he trapped the army of Lord Cornwallis at Yorktown with the aid of the French fleet, effectively bring an end to the War. In all, New Jersey was the site for over 100 battles during the War, and Washington’s army wintered in Morristown during 1777 and again in 1780. In 1783, the Continental Congress convened in June at Princeton after hastily departing Philadelphia following a confrontation with soldiers of the Army who were frustrated over their lack of pay and continued conscription. While at Princeton, the Congress received Washington in August to offer its official appreciation for his service. On November 2, Washington issued his "Farewell Orders to the Armies of the United States" from his headquarters in Rocky Hill, just north of Princeton in what is now a section of Franklin Township in Somerset County. Congress also received notice in November of the formal end of the War with the signing in September of the Treaty of Paris. 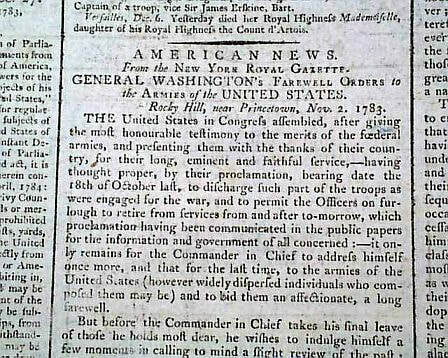 Washington's "Farewell Orders to the Armies of the United States" as printed in British newspaper. Following the Revolution, New Jersey became a somewhat uneasy participant in the union with her larger sister states. New Jersey trade was hurt by the refusal of merchants in Pennsylvania and New York to honor paper money authorized by the New Jersey Legislature. New York also enacted measures requiring duties and inspections of goods shipped across the Hudson to New Jersey, leading in 1785 to the New Jersey Legislature’s refusal to ratify legislation to allow the Congress to tax imports to raise revenue to fund the federal government. New Jersey’s show of defiance and her conflicts with other states over trade helped highlight the need for a new arrangement to govern the relations of the states. At the Constitutional Convention convened in Philadelphia in 1787, New Jersey became the leading advocate of the interests of the smaller states. The “New Jersey Plan” advanced at the Convention by William Paterson proposed equal votes for each state in the two houses of the proposed federal legislature; the New Jersey plan was intended to oppose the proportional representation concepts incorporated in the “Virginia Plan” supported by the larger states. Ultimately, the Convention agreed on a compromise between the New Jersey and Virginia models, establishing the new Senate on the basis of the New Jersey model with equal representation to each state and the House of Representatives incorporating the Virginia approach in allocating the number of representatives on the basis of population.